The organisers of Electric Fields have apologised for their handling of the announcement to move the festival from Dumfries and Galloway to Glasgow. Ticket-holders were initially offered a partial refund for the festival, which is to relocate from Drumlanrig Castle to SWG3 in Finnieston. But after an outcry on social media, organisers issued an apology and admitted: "We got that wrong". Full refunds will be offered to those who do not wish to attend the festival. In a statement issued on Tuesday, organisers blamed rising costs and "logistical and transport challenges" for the decision to move the festival to Glasgow. They offered partial refunds for those who had already bought tickets for the three-day event, which takes place between 4 and 6 July. However some ticket-holders reacted angrily to the decision, pointing out that it would cost them more to pay for three nights' accommodation in Glasgow. Overnight, the brothers behind the festival - Alex and Nick Roberts - posted an apology on social media. And in an email sent to ticket-holders, the pair said: "We're sorry, we got that wrong." They confirmed they would offer full refunds to those who did not want to attend the festival at SWG3. And they added: "From the start we have put on Electric Fields with the intention of hosting an exciting festival for music lovers from around Scotland and further afield. "The support we've been shown over the years as we've grown the festival has been overwhelming. "We've never taken that for granted and we never, ever intended to throw that support back in anyone's face." 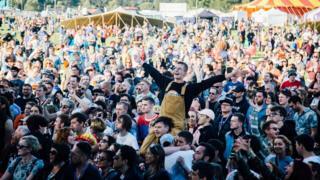 They admitted that they "massively underestimated" how the change in venue would affect so many of the festival-goers. "It has been one of the most difficult decisions we've ever had to make and it has not been made lightly," they added. "Our main focus was to ensure we delivered Electric Fields in spite of new challenges faced, rather than no festival at all." Their apology was welcomed by ticket-holders, including David Skeoch who was disappointed the festival had moved from a rural to urban setting. He told the BBC Scotland website: "I feel a bit sorry for the organisers as they have got this badly wrong and totally misjudged the impact. "I hope they can recover and bring the festival back where it started next year but it doesn't look that hopeful." Metronomy, The Vaccines, Sleaford Mods and Frank Turner are among the acts due to take part in this year's event. It was estimated that last year's festival generated £1.5m for the local economy in southern Scotland. More than 8,000 watched the Friday night headliner - Noel Gallagher's High Flying Birds - in a new attendance record for the festival.